Squirrelled away late at night on BBC Two are re-runs of The Tudors, and, watching it from the start and at a rate of four episodes a week, the whole thing has become like a 16th Century Neighbours, only with much better costumes and an unrivalled attention to facial hair. Telling the story - vaguely - of England's King Henry VIII and his many, many wives and his realm and reign over four seasons, it's become something of a late night treat. And the multiple episodes a week give it a soap opera feel it never had on its original once-a-week showing. Treason, beheadings, renouncing the Catholic Church in order to grant the King a divorce and him then mercilessly crushing the resultant uprising in the north - Emmerdale was never like this. And where else would you see the singer Joss Stone cast as a character considered "too ugly" to be the King's bride? It is by turns a world of gruesome torture, and endless sycophancy towards the King in a God-fearing society. But it's also a world of billowing night dresses, that finely constructed facial hair (from series two onwards only, mind) and impossibly perfect teeth no one would ever have had in the 16th Century. But let's not dwell on details - 'TIS DRAMA. Great escapist and partially-truthful nonsense tv? Why yes, your Majesty. Related stories: The Tudors: Verily, my Lord is so modern! 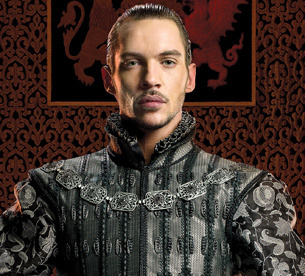 And I would certainly say 'oh, why yes, your Majesty,' to Jonathan Rhys Myers. Now if Henry VIII looked liked that in real life he probably would have had 16 wives!